These are a smaller version of the Guitar Pendant with an offset hole so it adds a bit of visual difference when incorporating into toys (or dress it up as a foot toy). 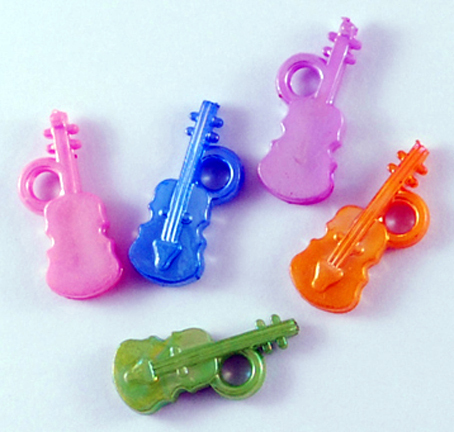 These are a smaller charm that is great for the smaller beaks in your house or as additions to other toys. The 4mm hole will easily accommodate leather lacing, paper rope, neon laces etc. Great additions to your toy making collection ... to dress up existing toys, create a fun foot toy or make some new goodies for your feathered family to enjoy! There are a wide assortment of colors and a fun, tongue teasing texture enjoyed by most every size parrot in your house!